These are definitely the faces of people who don’t know how to stop a currently exploding nuclear bomb. So many moments of melodrama in Barry Allen’s life come down to him wailing that he, a man who tells us he is the fastest man alive all the time, just isn’t fast enough to save the day sometimes. 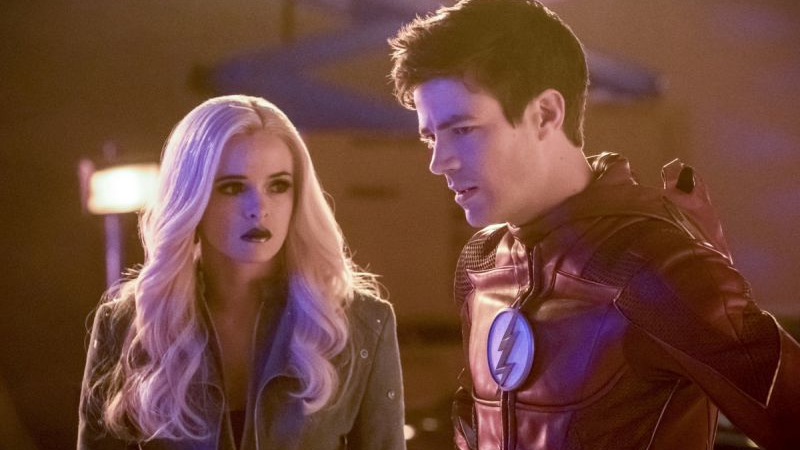 But last night’s episode proved that he really actually is more than fast enough, he just needs to be smarter about it—a lesson learned by a great episode that utilized a new speedster power and a great premise. “Enter Flashtime” is based around a simple, yet rarely-used idea four seasons into the scarlet speedster’s adventures: A group of weirdo eco-terrorists are trying to set off a nuke in Central City (for, err, reasons). This time, however, when Team Flash arrives on the scene they aren’t paying quite enough attention, and the terrorists actually succeed. Because this is not the series finale—boy, that’d be a downer—we don’t cut to credits as Barry and friends are obliterated by nuclear fire. Instead, Barry and a visiting Jesse Quick jump into what they call “Flashtime,” a sort of time-dilating hyperspeed that means that they’re basically running around so fast that, to us viewers, time for the rest of Central City has stopped. Then they try to use their time—which equates about half a second or so in actual time—to try to figure out how to stop a nuke that’s already going off. It’s honestly almost flabbergasting that The Flash hasn’t done an episode like this, because it’s a rad as hell idea that only something like The Flash can do. Last night’s episode leaned into the idea for all its worth in some great ways—whether it’s in Grant Gustin’s excellent performance anchoring the whole thing, or the eerie lighting of a Central City locked in the miliseconds before its destruction as Barry, Jesse, and eventually even Earth-3 Flash Jay Garrick (a welcome guest appearance by John Wesley Shipp) zip around it. A CW budget is not always going to be able to show the true height of the Flash’s most visually bombastic superpowers, but “Enter Flashtime” is probably the closest The Flash has ever got to doing so, and it was a goddamn delight. Turns out running at hyperspeed to slow down time is a sweaty business. So, as a standalone episode, it was pretty great, but “Enter Flashtime” also sort of just breaks The Flash as the show we know it—the one where Barry Allen frequently bemoans that he just doesn’t have the speed—into itty bitty bits. Because holy hell, he does have the speed! The episode does a great job of not just showing that, but also by showing us that Barry, Jesse, and Jay are on a completely different level to the rest of the heroes on the show, by having Barry pull them into Flashtime only to watch them get completely freaked by the effects of it in a way the speedsters just aren’t. It’s simple, yet clever way to remind us just how powerful Barry’s abilities actually are. Yes, Flashtime is meant to be an extremely draining ability to use, and both Jesse and Jay have to peace out of Flashtime because they just don’t have the energy to keep up. Even Barry’s splayed out on the floor, completely zonked out by the end of the episode, after he finally figures out how to stop the blast with some help from Iris. Then again, he also just managed to stretch out maybe a second of time into goodness-only-knows how long. That would’ve been very handy to do in practically any of Barry’s other big encounters in his career as the Flash! The Speedforce has been used to handwave an awful lot of things on The Flash, I don’t see why Flashtime couldn’t be something the show actually leverages is a bit more going forward. But this is more of a fannish quibble rather than a legitimate concern, admittedly—it’s part and parcel of trying to adapt a character that has abilities so vast and at times incomprehensible that they can seemingly do almost anything. At least “Enter Flashtime” broke through that suspension of disbelief for the purposes of an episode that not only was thankfully mostly separate from season four’s ongoing arc with the Thinker, but also did something the show has never done before, making it one of the best episodes in recent memory.